From the early days of Frederick Huish and Jack Hubble to the celebrated skill of Les Ames and Godfrey Evans — down the years Kent has been blessed with several remarkable glovemen. And amidst all the eminent men who have crouched behind the wicket, none have touched the levels of sustained brilliance as Alan Knott. Knott, with the cross denoting wicketkeeper, was a permanent feature of England scorecards during the 10-year period of 1967 to 1977. The attribute of permanence is not bestowed lightly here. England played 93 Test matches during this phase, and Knott appeared in 89 of them — 20 more than any other England cricketer. In a side that is historically not reputed for constancy of selection, Knott was a fixture that was forbidden to tamper with. In the entire land there was no one who came anywhere near his perfection behind the stumps — and arguably no one in the rest of the world did so either. His work was as without blemish as imaginable. Keith Fletcher, who played as many as 51 Test matches alongside him, does not remember a single dropped chance or fumbled stumping. Ray Illingworth, not one to shower accolades on fellow cricketers, once remarked that Knott was streets ahead of the rest of his peers. When England won the Ashes under Illingworth’s captaincy in 1970-71, the captain said that it was not possible to keep better than Knott had in that series. While pouching snicks off fast bowlers, or whipping off the bails after the bat was beaten by a tantalising spinner, Knott was sprightly, skilful and splendid. He was spectacular even when there was nothing going on. With the field being set or the batsman taking guard, or the action halted due to the 12th man dashing across with a pair of gloves or the extra bat, Knott could be witnessed limbering up with a succession of curious stretching exercises.His enthusiasm was infectious. It lifted the spirits of the whole team in the toughest and drabbest moments of toil in the field. It was obviously an immense bonus that Knott could bat too. Plucky, courageous and unorthodox, he could be dangerous on occasions and stubborn when the team was in crisis. Nimble footed against the spinners, using the sweep to frustrating effect, he was a great cutter of the ball, often playing the shot over the slips. He was good enough to score five Test match hundreds, including one against Dennis Lillee and Jeff Thomson at Adelaide. In spite of the 95 Tests with a then world record of 250 catches and 19 stumpings, with all his finesse and flair on display around the world, it was said that to catch Knott at his best one had to see him keep for Kent on a wet wicket with Derek Underwood running in to bowl. The left-arm spinner would bowl faster and faster with the wicket adding to his menace, the ball bouncing awkwardly or keeping low at the whims of chance and the vagaries of the pitch. Knott would be up at the stumps, taking balls beside his boots or chin, with equal poise and élan, as if pouching lobbed up rubber balls at indoor nets. The combination of Knott and Underwood resulted in 198 dismissals in all. The St Lawrence Cricket Ground in Canterbury has now renamed the Annexe Stand as Knott-Underwood. The two have now joined the ranks of other Kent legends who have lent their names to the Stands of the ground stand like Frank Woolley, Colin Cowdrey and Les Ames. Wicket-keeping was perhaps in Knott’s genes. His father Eric was a very good ’keeper at the club level, and at the age of four the young Knott caught glimpses of his father in action. The first lessons of the craft were learnt in the big hall at home, where father and son took turns to stand behind the wicket as the other threw balls at the wall and played the rebound with a stump — leading to a thorough grounding in catching all sorts of snicks. The next season Knott captained the Kent Schools, played for Southern Schools and England Schools. A curious advice now came from the great England wicketkeeper Leslie Ames. Impressed by Knott’s all-round abilities, Ames told the boy to try and become an all-rounder. “I would not worry about the wicket-keeping too much, you stick to your bowling,” he counselled. In 1965, Knott was named Young Cricketer of the Year by the Cricket Writers’ Club. The same year he was awarded his Kent cap. He still used to bowl some canny leg-breaks and that season Tichborne Park saw a unique dismissal. Knott picked up three wickets playing for International Cavaliers, and the left-handed Danny Livingstone appeared on the scoreboard in a unique manner — caught Godfrey Evans bowled Alan Knott for 51. In 1967, Knott made his Test debut against Pakistan at Trent Bridge. He failed with the bat, falling for a duck, but took seven catches and did not concede a bye in England’s win. Intikhab Alam was the first batsman at Test level to fall to the combination — caught Knott bowled Underwood. 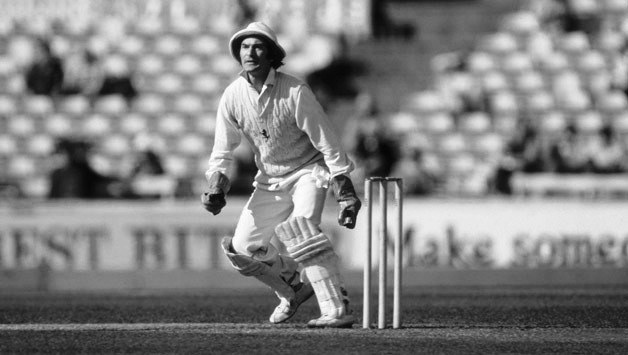 Knott was not the first-choice ’keeper when England toured West Indies under Colin Cowdrey. Jim Parks played the first three Tests before he got a look in. The fourth Test at Port of Spain has become famous for Garry Sobers declaration at 92 for two in the second innings after which England chased down the required 215 runs on the last day. Knott kept impeccably and scored an unbeaten 69 in the first innings. In the final Test at Georgetown, Sobers and Lance Gibbs reduced the Englishmen to 41 for 5 in the fourth innings and a defeat loomed large with plenty of time left in the match. Knott added 127 with captain Cowdrey, and batted with the tail to remain unbeaten with 73 made over 4 hours. England held on for a draw with 9 wickets down. Knott went on to play several brave innings in his career, but this was perhaps the most vital. In the summer of 1968, Colin Cowdrey famously asked help from the spectators to dry the outfield at The Oval, before Derek Underwood thrived on the wet wicket to square the series against the Australians. Knott was again at his sublime best, keeping flawlessly to the deadly left-arm spinner, Doug Walters falling to their combination this time. When England regained the Ashes in 1970-71, Knott was pivotal in the triumph, with five catches and a stumping in the decisive seventh Test match at Sydney. Riding on the triumph, Knott sat out for a Test as Bob Taylor was blooded at Christchurch. In the next Test at Auckland he was back, scoring 101 in the first innings, finally notching up his maiden hundred in his 25th match. For good measure he scored 96 in the second innings. In England’s next Test match, against Pakistan at Birmingham, Knott hammered 116. By now he was a formidable figure both behind and in front of the stumps. From the Auckland game to the epoch making moment when Kerry Packer divided the cricket world, he did not miss another Test match. By the time England toured India in 1972-73, Knott was considered an important member of the team’s think-tank. In the Bombay Test, with captain Tony Lewis and vice-captain Mike Denness both off the field, the Kent wicket-keeper led the side for the first and only time during a Test match. During the next few years, Knott’s ’keeping was as facile as ever, and along with Tony Greig, he combined to form a fantastic lower middle order for England. He was outstanding with the bat in the Caribbean in 1973-74, playing a leading role as the series was squared. In the Gillette Cup of 1974, Knott as at his mercurial best. He won Man-of-the-Match awards in both the semi-final and final, as Kent won the tournament for the second time. He took three catches and scored a vital 20 against Somerset in the semi-final – a team that included Viv Richards and a young Ian Botham. In the final against Lancashire, he took two catches and effected a stumping and a run-out before scoring 18 not out. It is perhaps the only instance of two consecutive Man-of-the-Match awards presented for sheer ’keepingbrilliance. And as Lillee and Thomson pulverised the English batsmen on their tour of Australia in 1975-76, Knott stood fearlessly against the onslaught, improvising continuously, scoring 364 runs in the Tests with three fifties and a gallant 106 at Adelaide. The 1976 summer against West Indies was one of the most disastrous for England, following the ‘grovel’ remark of Tony Greig. England were routed 0-3 by some hostile fast bowling and merciless stroke-play. However, Knott played several plucky innings through the series– including 116 at Headingley. He added 152 with Tony Greig in a fascinating rearguard action against extreme pace, and in the process scored seven runs from a single delivery. Knott pushed Vanburn Holder to extra-cover for a quick single, and Bernard Julien rushed in to throw past wicket-keeper Deryck Murray. Knott and Greig ran two overthrows before Andy Roberts, fielding at square-leg, made his way to the ball and threw it past the stumps at the bowler’s end to the long-off boundary for four more runs. Fifties flowed from his bat in each innings of the next and final Test at The Oval. However, it also saw him notch up a stupendous feat behind the wickets.Knott stumped Lawrence Rowe off his old crony, Underwood, to set a new wicket-keeping record of 220 victims, going past Godfrey Evans. The following summer, Knott played another major role in the Ashes triumph. At Nottingham, he walked in with England in trouble at 82 for 5, and added 215 for the sixth wicket with Geoffrey Boycott. The 135 he made in that Test would remain his highest score. In the process he also became the first wicketkeeper to pass 4,000 Test runs. It was, however, during this series that Tony Greig was clandestinely recruiting the best of cricketers for World Series cricket. Knott signed on the dotted line and his incredible run of 64 consecutive Tests was derailed. He was to play just 6 more in his career. He did not play at the highest level again till the summer of 1980. He performed with usual flourish behind the stumps, but could not reach double-figures with the bat in the 4 Tests he against the West Indies. David Bairstow was preferred in the final Test and the return series that followed. Knott signed off with the final two Tests of the 1981 Ashes series. At Old Trafford, he added 149 with the rampaging Ian Botham, scoring a crucial 59 in the Ashes securing victory. In the final Test at The Oval, he scored an unbeaten 70 and saved England from defeat with a partnership of 93 with captain Mike Brearley. In the winter of 1981, he accepted the offer of a rebel tour to South Africa and that ensured the end of his Test career. Knott finished with 250 catches and 19 stumpings, a world record at the time of his retirement. With the bat his deeds amounted to 4,389 runs at 32.75 in 95 Tests, with 6 hundreds and 30 fifties. During his playing days, Knott was famed for his idiosyncrasies. Apart from his exercises at every available moment, he also kept his collar up all the time to protect himself from the sun. His sleeves would be rolled up to prevent bruises to his elbow while diving. It is rumoured that he dipped his hands in warm water before taking the field. No cricketer in the world worked harder to keep himself in prime condition. In the winter he trained regularly with Charlton Athletic FC. He also spent hours playing table tennis with utmost seriousness, believing that the game would improve his footwork, reflexes and reaction. He kept turning out for Kent till 1985. After his playing days were over, he enjoyed grooming young players like Jack Russell and Alec Stewart. He also spent time coachingson James Knott who played a handful of matches for Surrey. At the turn of the century, Knott left the coaching scene — quite early for a man of his immense experience. For someone who protected himself from the sun, he surprisingly chose the sand and seas of Cyprus for his retirement and has been there ever since.